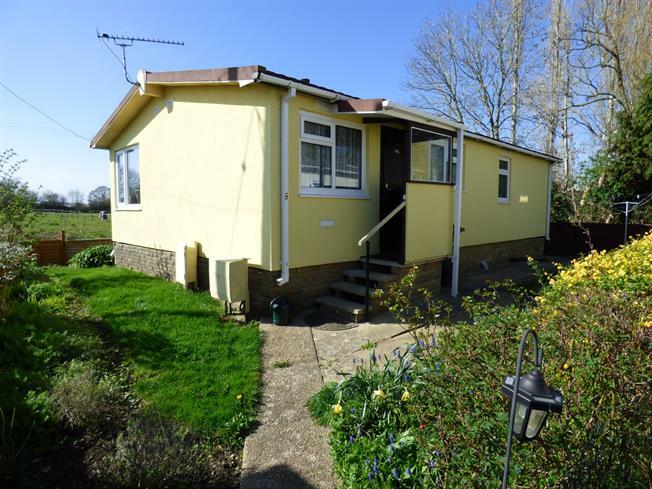 2 Bedroom Detached Bungalow For Sale in Martock for Guide Price £83,000. Situated on the edge of a small residential site for the over 50's and having far reaching rural views. Two bedroom twin unit mobile home with an enclosed garden and garage. Comprises fitted kitchen/dining-room, sitting-room with rural views, bathroom and two bedrooms with fitted wardrobes. No onward Chain. PLEASE NOTE THAT WHILST THE MOBILE HOME HAS RADIATORS THE SYSTEM DOES NOT FUNCTION AND REQUIRES A REPLACEMENT BOILER. Enclosed porch, uPVC double-glazed entrance door. UPVC double-glazed windows to the front and side elevations, fitted with a range of panel fronted dark wood base and wall mounted units with laminate work surfaces, double-drainer stainless steel sink unit, tiled splash-backs, radiator, pluming for a washing machine. UPVC double-glazed bay window to the rear elevation with a far reaching rural view, uPVC double-glazed window to the side elevation and a uPVC double-glazed door to the garden, central tiled fireplace with matching hearth and redundant not functioning back-boiler for removal or replacement, two radiators. Airing cupboard with immersion heater and shelving. UPVC double-glazed window to the rear elevation with a far reaching rural view, range of fitted wardrobes with vanity basin inset to vanity bar, hanging rail and shelving, radiator. UPVC double-glazed window to the side elevation, radiator, range of built in wardrobes with hanging rails and shelving, fitted dressing table, radiator. UPVC double-glazed window to the front elevation, fitted suite comprising panelled bath, low-level W.C, wash-hand basin, tiled splash-backs, radiator. Situated to four sides of the property, with a far reaching open rural view, laid to lawn with patio area, shed and aluminium framed greenhouse. Please note that whilst radiators are fitted at the property the gas fired central heating boiler does not function and will require removal.